This painting is a modern version of a very traditional image. It could have been drawn in sand at a desert gathering in the far past. It could have been painted in Papunya in 1071 by the most highly acclaimed of the early western desert artists. It is an index of the country, much like the ones they made. 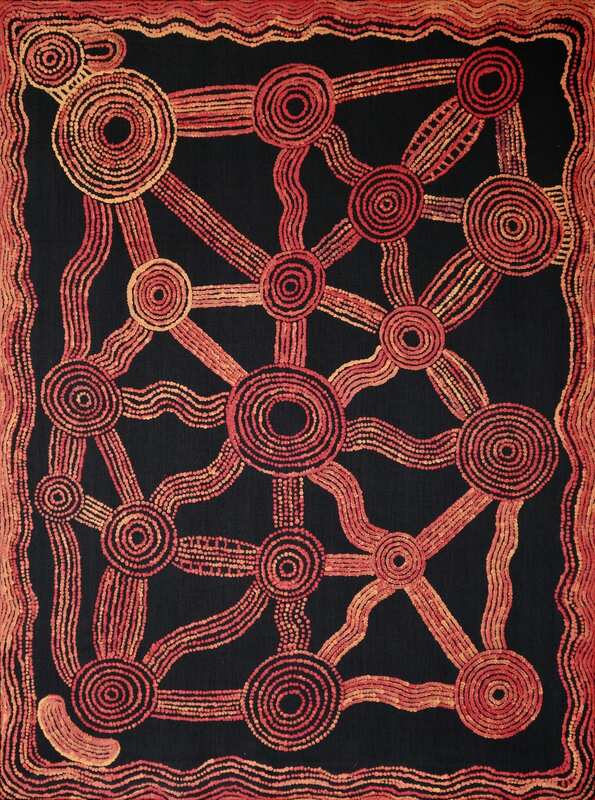 the key to the canvas is Kallipinypa rockhole - the circle Alison has placed at the centre of this painting. Among the other roundels in the image are the potent rain increase sites of Tjikari, Puyuru and Mikanji, all crucial points along the path of the rain Tjukurrpa - the so called "dreaming" lines. The last of these, Mikanji, is a place Alison feels bound to with special force: it lies very much within her father's part of the song and story-track. Fire and water dreamings are interconnected closely in this part of the desert. There is an inner logic in the rendition, as here of water dreaming sites in the colours of fire. The four key sites shown in this canvas are places that call out to each other in storm times, vying with each other in thunder and lightning flashes to prove their strength. The fiery reds and oranges are hence also the blazing light of the lightning flashes seen against the night sky. The painting is, of course, a topography of the western desert landscape, reaching from Yuendumu south to Mount Liebig, Ayers Rock and beyond. But it has other layers of signification as well, which the artist describes as follows: "Many women are depicted in this painting, figures who are key actors in the ancestral ran story: Namitjinpa, Nangala and Nakamarra. For us, these stories come alive in our ceremonies, where we're reminded very strongly of something sacred coming to the surface of life, You can also see this as a painting about connections. Every person who owns the water dreaming song-lines of the desert is linked. We are all bound by ties of closeness - a tapestry of story binds us together as a group of people."